Editor’s note: On June 21, 2016 seven members of the Young American Junior Big Boat Sailing Team were among the very first finishers of the 50th running of the Newport Bermuda Race. 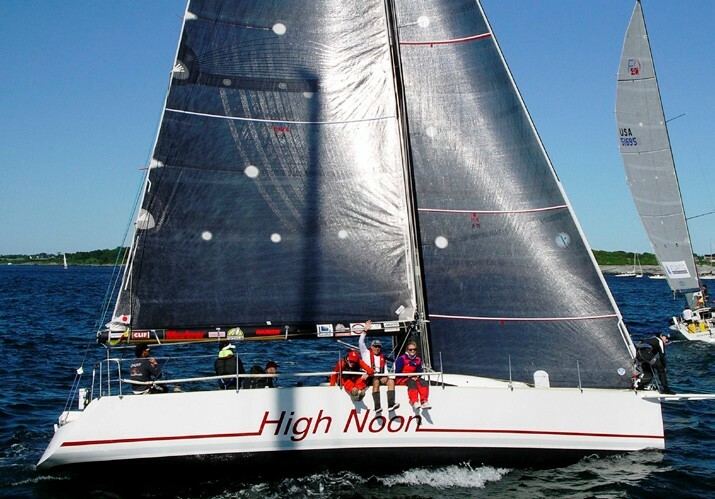 Sailing High Noon, a Tripp 41 on loan from the U.S. 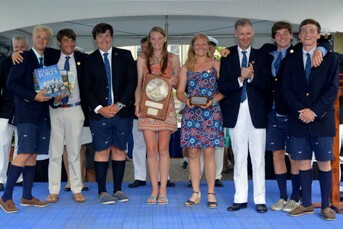 Merchant Marine Academy Sailing Foundation, these remarkable sailors (ages 15 to 18) won their class in the St. David’s Lighthouse Division and were the first recipients of the new Stephens Brothers Youth Division Trophy. In my first year in the American Yacht Club Junior Big Boat program, I could remember my dad, Peter Becker, and the older team members daydreaming about sailing in the 2014 Newport Bermuda Race, which was happening the following year. At that point I was still figuring out my way around our newly named J/105, Young American, and beginning to learn the basics and some tricks here and there. For most of us, the Bermuda Race was just a dream. When I was little I would shadow my dad when he completed his inspections, just to see the boats that would be competing in the Bermuda Race. When the start date rolled around, I made sure I was there on the water, watching the boats cross the line. Watching boats sailing into the distance made me wonder what it would be like to be isolated from land. I was curious about what it would feel like to wake up the following morning and be in an ocean, so far from land that you can only depend on yourself and the people around you. I felt a pull. I held a desire that made me want to seek out those boats. I hoped to follow them out into the Gulf Stream and experience the open ocean for myself. I could say that is where my thirst for ocean sailing started, but I think it was actually when I got out there for real. About a week later, my dad, my brother Key Becker, Will McKeige and I got on a plane and flew down to Bermuda. We stayed one night and then headed out to help deliver Maximizer, a Swan 72, back to Newport. I learned so much about ocean sailing during that delivery, and my eagerness to race to Bermuda grew. Fast forward about a year to August 2015, about 340 days before the start of the 2016 Newport Bermuda Race. The Young American Junior Big Boat Sailing Team was up to par, and ready to get a boat and go race. We had all put the time in on the Vineyard Race, the Block Island Race and the Around Long Island Regatta, and were excited for the challenge. Of course, the first obstacle was finding a boat. As the fall flew by, the team could not secure a boat and nerves began to flare. There were definitely times when I thought our team would be on the sidelines and not on the racecourse that following June, but thankfully a deal with High Noon was struck and the team could start getting to work. Just as the High Noon operation was getting underway, I was getting ready to leave home for four months at a semester school. Being on the other side of the country while the race was coming together was agonizing, because all I wanted to do was help. So much work had to be done, from paperwork to boat maintenance, and the effort seemed inordinate. I felt my dad getting stressed, worrying if the boat would make it to the starting line, prepared to sail the next 640 miles. I also saw my teammates feeling overwhelmed from school, sports, and boat work all needing to be done at the same time. I knew if I were home I would have been a big help. I also missed out on learning the boat backwards and forwards when she was ashore. When the Block Island Race rolled around, the team was all home and ready to race. Ideally, we hoped everyone would be one with the boat and work seamlessly with each other, but that just was not the case. We all saw that there was work to be done, but nothing that could not be accomplished by June. The Juniors also brought moral support – we were all there for each other. We helped out packing kites when others weren’t feeling very well, or consoled one another when the wind and seas got a little too big for our comfort. Not to mention that our go-to medic, Will McKeige, is only 18. He took care of us by making sure we all had our patches on, stayed hydrated, and didn’t cause enough trouble to make him use his real medical skills! I really enjoyed racing with Juniors because we brought an energy that couldn’t be matched by an older, more experienced crew. One of my fondest memories of the race was one of the last days, when we felt close to Bermuda but actually had many more sea miles. We had the kite up and a solid breeze that came with some seas. All the kids were on deck the whole day because we made a pact to push it to the approaching finish, while the adults were up and down getting their needed shuteye. Everyone was so happy just to be where we were. We were all taken aback by what we were doing, and the fact that we were surfing seas in the Atlantic and having a blast. It was a time when our lack of experience drove us to enjoy and push ourselves harder. When people ask me, “What was High Noon’s secret for doing so well?” I think of that day, because it was our “lack” of experience that made us go so fast. 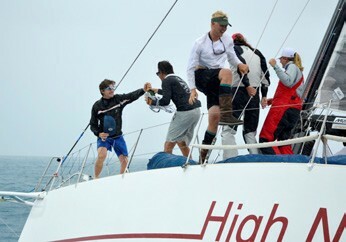 We were seven fresh sailors giving 110% percent because we were just so ecstatic to be ocean racing. We had so much pure joy from our inexperience that we were just running on adrenaline the whole time. Another of High Noon’s secrets was the three adults on the boat. Guillermo Altadill, Peter Becker and Rob Alexander were the backbone of the operation. They brought to the table all the knowledge that we lacked, and constantly taught us how to improve. They acted as crewmembers, just like the Juniors. Each of them were watch captains and were paired with two or three juniors per watch. They led navigating and Peter, my dad, was the un-named cook. Having Guillermo aboard was one of my favorite parts of the race. A veteran of four Volvo Ocean Races, Guillermo was tough on the crew and had high expectations that we all wanted to live up to. His presence kept us on track and energetic about moving fast. He taught us that “sailing fast isn’t free” and that there is always risk involved when you are pushing yourselves and your boat. But he taught us how to manage that risk. When needed, Guillermo was never shy of a reef or a smaller headsail, but he was always ready to get more sail area whenever possible. He definitely pushed all of the Juniors out of our comfort zones, and made us better sailors for it. Our success in the race would have not been possible without the adults, because of the support and knowledge they shared with us.